In the 80's, "Realworld" meant an entry-to-midlevel accounting package that was itself a derivative of MCBA software. Realworld was one of the earliest semi-cross-platform packages which made several appearances on Unix-based systems otherwise only used for scientific or engineering applications (thanks to some terrific porting by the forerunner of Acucorp). But DARPA has co-opted the term and given it a serious combat connotation. DARPA's version unites a laptop with a 3D game-based environment that is intended to make real time simulations easier to design and deploy. 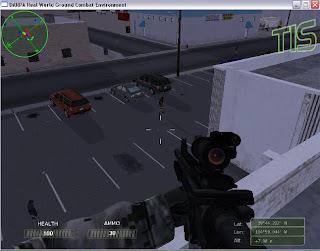 That's the stated goal of a $12M contract mod to Total Immersion Software, who supplies DARPA with the core technology. According to Defense Industry Daily, the original contract was heavily competed, with over 100 proposals received for DARPA's 2005 solicitation. Total Immersion has also developed ACE, an air Combat Environment system used as a mission rehearsal system. TI claims this system allows for import of a realistic order of battle and interoperability with existing mission planning software. This "RealWorld" sounds like a lot more fun, and the UI is, on the surface, light years ahead of the green screen era. But underneath I suspect the software challenges are more the same than different.